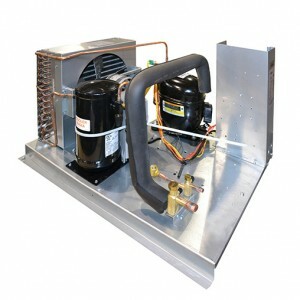 Kolpak’s refrigeration design has more condenser surface and less clutter inside to maximize airflow across the condenser, yet the hinged weather housing and footprint are exactly the same size as before. The increased condensing capacity means that the system works more efficiently and operates without fail in the most extreme temperatures. Some competitive refrigeration systems break down or “kick out” when ambient temperature reaches 105°. It continues to perform when temperatures reach 120°. The system also has an oversized fan blade powered by a PSC motor – a true electric motor – that moves air more efficiently. At first glance, Kolpak’s new Refrigeration System is a study in simplicity. You will notice the absence of capillary tubes winding through the system. They have been replaced by high-accuracy pressure switches to eliminate possible leakage points. Brazed joints also replace mechanical fittings to further reduce the possibility of leakage. Plus, with so much open space in the system, every single component from the electrical box to the condenser is easy to access for adjustment or service. It is built so smart, you will save energy costs to run it.